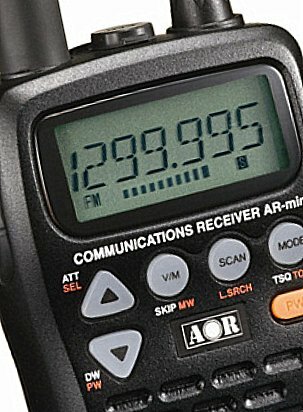 While browsing the front page of Universal Radio recently, I noted that the AOR AR-Mini B handheld communications receiver is currently on sale. I thought the AR-Mini B was discontinued. This receiver used to sell for about $259 US. I contacted Fred Osterman (President of Universal) for more details. Fred informed me that, a couple of weeks ago, AOR USA announced the availability of the model once again. He noted that the units arrived from AOR JAPAN to AOR USA last week and they are now in stock. Fred seemed as surprised as I was that the Mini B resurfaced. He confirmed that AOR have these in quantity–they’re not simply units discovered in a warehouse corner somewhere. They could be surplus from a large special order. The AOR AR-Mini B is not a perfect receiver, but at $159.95 it’s a pretty good value for a very rugged, water-resistant receiver that puts much of the radio spectrum in your pocket (100 kHz to 1299.995 MHz). If you’re tempted to purchase the AOR AR-Mini B, check out this review by Larry Van Horne (PDF) and this review by Dave Zantow first. This entry was posted in AM, New Products, News, Shortwave Radio and tagged AOR, AOR AR-Mini B, Handheld Receivers, Scanners, Universal Radio on October 13, 2015 by Thomas.